The concept of running a multi-day race on a lap course is often very different from running a race that goes from point A to point B. There's no fixed distance you have to cover, and you very seldom get to experience panoramic scenery — on the contrary, the course is often rather boring and is usually a 1-mile, a 1-kilometer or a 400-meter loop. The rules are simple and apply to any race (defined by a time limit) you choose to compete in, whether it's 6 hours, 12 hours, 24 hours, 48 hours, 3 days, 6 days or even 10 days. You do what you want with your time — you eat, sleep, rest and shower when you want to — but the runner who completes most laps within the set time limit wins. Ellen and I at the finish line. So many feelings! This is the report from my second attempt at a 6-day race. I did win. And since this is my first victory in an international ultramarathon, I should be happy with the race, right? Of course I'm happy with my win and 720 km is a very, very long distance. But it was far from what I had trained, planned and hoped for. But so many things happen in 6 days. It's like a lifetime. And you cannot really plan for what happens in a lifetime, can you? Also worth noting: I wore my X-Kross for many hours every day, used a lot of Magnesium Spray on my legs, drank a lot of corn-drink (not available for purchase yet), ate a lot of greek yoghurt with honey, and learned the benefits of eating Kinder Chocolate late at night. Ellen said that the most valuable asset for her and for making the crew job work, was our Hydroflasks. The 6-day runners at the starting line. All dressed up for an unusually cold day in Greece. After only 1 lap! I was in second place! The weather. We had dreamt about a chilly February week in Greece with perfect temperature for running. Instead we got the end of the worst Greek winter in years. It was freezing cold and the wind was terrible. I started the 6-days running race with a huge objective in mind. In my first 6-day race one year earlier, I managed to get 789 kilometers as a beginner, and that with some bad decisions along the way. I knew that wasn't even close to my capacity, so when planning for the competition in Athens, I really wanted to challenge myself. No more Mr Nice Guy who is conservative and holds an even pace througout the race. No, I would raise the stakes and go all in. Hold on for as long as possible, and learn from the experience. To start in a pace that’s much higher than your expected avarage pace, is always a bad idea in running (and it doesn't matter if it's a 5-k race or a 6-day race, the same applies). Especially in ultrarunning where you can lose enormous amounts of time and distance, if you get yourself exhausted in the beginning. So the risks were high, but at the same time I always learn a lot from breaking my own rules, and it’s really hard to know the boundaries of your potential if you're never challenged. Recovery packs for a long race. I had the schedule all figured out. Each day was divided into 5 running blocks (or work periods), every block consisting of 4 hours out on the course, which left about 4 hours for sleep and other breaks. Every hour in the 4-hour work period consisted of 25 minutes running, 5 minutes walking, 25 minutes running and 5 minutes walking. Before each walking segment, Ellen would hand me something more substantial (in texture or volume) to eat. The energy plan was not very complicated; corn-drink complemented by fruit, real food and greek desserts. We tried to alternate between different flavours and textures to keep my interest in eating as high as possible. Furthermore I had a regiment with vitamines, salt and minerals to take regulary throughout the event. I figured that if something was going to deplete me of essential nutrients, it's running around the clock for 6 days straight. The main problem however, proved to be how completely exposed the course was to wind, sun and rain. Whatever the weather was at the moment, it was setting the agenda for the day — and the course offered no protection. We were running on the landing field of an old airport and with the mediterranean sea nearby, we quite naturally had some wind. But the wind and the temperature during the first two days of the race were unexpectedly cold. The wind blew through bone and marrow. And in the morning you blew white mist out of your mouth. At the same time as I was freezing, I also felt hot, trying to keep my pace up. It was probably due to the crazy wind during the first days, that I had such trouble regulating my body temperature for the rest of the race. And to stubbornly stick to my aggresive plan during these weather conditions, was not my best decision. But in the moment it actually didn’t feel that hard. On the long stretch with headwind, I visualized myself being non solid and letting the wind blow right through me without any resistance. "No resistance" became my mantra in this part of the race. During my first 24 hours of the race, I stuck to plan. Every hour, I covered 8 or 9 kilometers and had most of my energy intake during the 5-minute walking breaks. I did 5 work periods, each consisting of 4-hours of running and slept about 2,5 hours. I ended up with 167 kilometers after the first day, perfectly on plan. A great start. Cold weather but no trouble keeping the pace up for the first 24 hours. I was freezing, shivering. I couldn't regulate my body temperature. The first day’s effort had already started to take its toll. And the weather was still cold, and the wind — I hated the wind. I was only in the beginning of the second day, but I could already feel the race slipping away from me. I was done. Ready to give up. My mind had had enough. When it comes to ultrarunning, I know my strength is not in my mind, but in my heart and soul — but when I tried to connect my awareness and calm my mind down, an internal war erupted. I almost cried out in pain as different parts of my consciousness were attacking each other. My soul is deep rooted and had no problem to continue at this point — this is who I am, I'm an ultra runner, this is what I do. My gut wanted to fight, my instincts were pushing me to continue, I just had to push through this dark, dark, place and everything would eventually change. My heart told me it shouldn’t really matter how I felt about the big goal and records that was slipping away from me and what that might mean in terms of result — to keep on moving is my religion. But my mind fought back with nuclear power: IT IS OVER!!! THERE WAS ONE GOAL, AND THAT'S GONE! QUIT, QUIT, QUIT! I talked to Daniele about the power of the brain. Daniele Alimonti from Italy was doing the 1000-miles race and had been running for 13 days. His body was completely broken down but his mind wasn't. When your mind is giving up, you start to feel all kinds of problems, he said. He pointed out that it was mainly my mind that was tired, not my body. Get your mind to think of something else, and the shivering will disappear, Daniele told me. But mind kept doing everything it could to stop me. I couldn’t turn things around, and my mind started to shut down even more functions. The burning pain under my feet became unbearable. The severity of that sort of pain is probably about the same during a race like this, but now I suddenly couldn’t tolerate it. My stomach stopped working and I got attacked with sickness. And my legs started screaming — every muscle protested. I simply couldn’t continue. So I did the only thing I knew how to do in that situation, and tried to start over. I got some rest, a longer rest than I had planned for at that time in the race, and then try to go out again. I can’t say the sleep made me feel much better, or really solved anything. But after a couple of hours, at least I managed to get up again and was somehow moving around the course. Ellen holding my hand when I was trying to get some rest. Only three days in and this was already one of the worst rollercoasters I had ever experienced. After the second night it was still cold, but the sun was shining. It was shining on me the whole day when I was fighting to get back on track. And of course, that was too much for me. I've never been good with the sun. So from starting the race with shivering from cold, I now got fever (and more shivering!) from sunstroke. Everything felt like a bad joke. Trying to cool down with a beer. Finally warm enough to wear shorts. Traffic and the Mediterranean sea nearby. I tried to focus on other objectives. I told myself this was a good opportunity to reherse doing the 4-hour running blocks when I'm exhausted. But it was impossible. 4 hours was way too long. I couldn't find any other tangible reason for continuing the race. I’d better stop and come back to do another 6-days race another time, with another strategy. When my body is acting this way, it's almost impossible to do a result that's even close to my objective. Reaching the 800 kilometers and set a new national record was not within reach anymore. Not when I was feeling like this. I have my limits. I don't run if I have a fever. So I slept. Ate. Tried to get up. But the fever and the shivering came back every time I started running. So I walked. Trying to avoid getting too much sun. The greeting from my friend Kobi Oren (a well experienced multi-day runner) before the race was ”May God have mercy on your soul”. I thought I could surely use a little mercy right now. I didn’t feel any mercy, I was only painfully aware of my limits. But I also understood that my limits were created by me, and only me. Daniele was still out on the course, struggling to get his 1000 miles, even though he was far behind schedule. He had to finish within the time limit of 16 days and it started to seem like an impossible task. But his mind game was the most impressive I’d ever encountered. His body broke down but he didn’t. When my body lets me down, I always surrender. I somehow started to understand that there was another option. But even now, I have trouble to understand which option is a wise one. It's not at all clear to me. Daniele has given me new perspectives on the concept of limits, and it kind of scares me. Is it possible to have no limits at all? It felt like everyone participating in the 6-days race was knocked out. They were sleeping. Sick. Sore. Stiff. I could still move, even if my body wasn't working as it should. But how could I blame it? To start a race like this with more than a 100 miles during the first day, is plain stupid. I felt like everyone around me started to understand what I had known since my body started to shut down early on day 2. The tall Swede with the red beard was a fake. He didn’t have the capacity to start a race that hard. Even the race director told Ellen "Your guy will not make it to 800! We've looked at his splits, and he can't possibly make it to 800!" Say what? I started to calculate. If I could only manage my secondary goal of staying on the course for 20 hours each day, 800 kilometers still wasn't impossible. Well, in reality it probably was impossible, as my body was protesting, but still — it wasn't completely impossible. The urge to show the world that I could do it ignited a fire within. My ego wanted to prove everyone wrong. Prove that I could do anything I set my mind to. Suddenly a fire was lit, and that fire created a connection between my soul, heart and mind. I have raised from the dead before. I could do it again. I would show them. Suddenly Daniele and I had the same mission. We were both doomed, but neither one of us was ready to accept defeat. We just wouldn't give in. Daniele promised me he would win the 1000 miles race for Sweden. And I told him I would do my utmost to win this whole 6 days thing — for him and for Italy. Daniele and I walking around the course. It ended with another crash. This one even harder than the ones before. This time even Ellen got worried. Up until then, she hadn't really accepted my talk of quitting — it was like she hadn't heard it. Maybe it was because it was later in the race, or maybe it was because I had pushed beyond other kind of limits this time. Nevertheless I was surprised. I was only going to the tent for a short rest, and yes, I was tired, it had been hard to try to keep the pace up for a while. But nothing that a little shut-eye couldn't handle. I thought. But I stumbled. Laid down and almost passed out, as my eyes were rolling. Crazy stuff. Felt worse than ever. So naturally we decided to take a longer break. I slept. And then I slept some more. I went out on the course after a couple of hours and made another try, but quickly realised that it wouldn’t work, nothing worked at this point. Better try to sleep all through the night and then see if things had changed in the morning. Or if we should go back to the hotel — or maybe to a hospital. This time the race was over for real. I could feel it with all of my being. But when I got up, Daniele Alimonti was still out on the course. He had very little time left. He had to finish his 1000 miles before 11 AM, but he couldn’t even walk upright. It felt like the race was over for real this time. When Daniele had 24 hours left of the time to finish his race, he still had 109 kilometers to go. An impossible task after he’d been running for 15 days and hardly made the minimum daily limit of 80 kilometers, for the last couple of days. But he wouldn’t listen to any of that. His mind, his inner fire, was burning with desire to finish. How he managed to continue during this last day and night of the race is beyond me. It was in every essence something that should’ve been impossible. But he kept going anyway. I quickly decided to walk with him durinig the last hours of his race. I could at least be there and pick him up if he fell again. But he didn’t. He only kept on moving, struggeling, grunting, stopping, starting, swaying. But meter for meter he got closer and closer to the finish line. Daniele finished his 1000 miles race with just 20 minutes of time margin. I will remember his victory forever. Seppo from Finland showing us his T-shirt, which says "DNF or DIE". I continued. The 1000 miles race ended before the 6-days race and I had to go on for another stretch of hours. Everything about the race felt like a joke, first I was too cold and then struck by sun fever. The last night came and I got up and out on the course. Again. Always back on the course. But as soon as I tried to run, I could feel the fever coming back. So I kept it slow and easy. I had nothing left, but I continued moving. I tried to comfort myself with the fact that I was still in the lead. If I only continued moving, I could probably stay on top. It's interesting to run a race that's long enough for you to go through the grief of losing your dreams, and still continue in a different state of mind. The last two days were meaningless. I had nothing to aim for, nothing to prove. I only had to finish. This is what I do, who I am. I'm an ultrarunner. I remembered that Daniele had managed to run 109 kilometers during his last 24 hours. This was at least something to think about. If he'd been able to do that despite the fact that he couldn't walk straight, then so could I. Actual running was still not possible, but walking I could do. I've never walked or even tried to walk for such long periods of time, so I was a little bit scared of what might happen to my feet and mobility. Maybe I'd finally get some blisters? But it turned out to be alright. The main difference was that I could eat a lot more, and needed to eat more as sleepiness was a major threat. During the last 24 hours I managed to be on the course for 21 hours, and did 118 kilometers. So when I had stopped crying over not reaching my goals, I actually ended up feeling rather proud. If I was able to be out more than 21 hours on the course, during the last day, then maybe (with a stronger body and a smarter plan) that will help me get a big number in the future. The race was over. I won. 1st place with 720 kilometers. Not close to what I had dreamed of, but my dream continues. Back at the hotel and actually feeling quite happy with my effort. 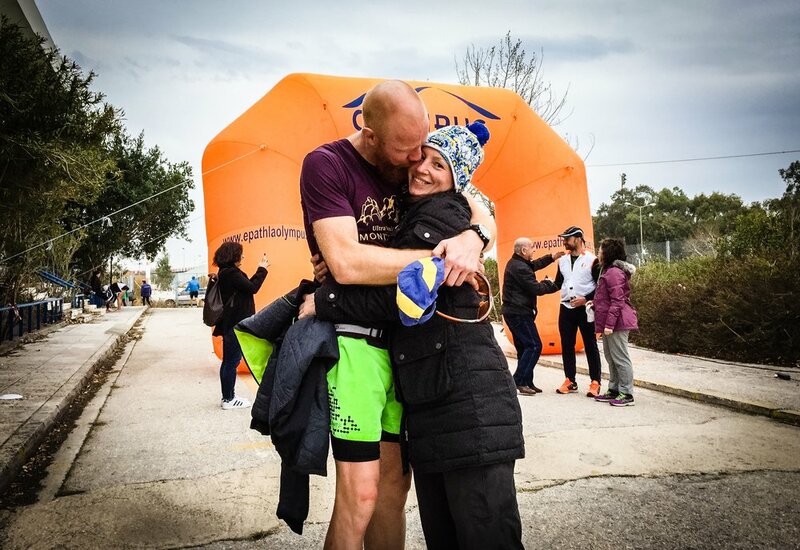 If you want to read up on Ellen's live reports throughout the event, check it out on Facebook on the page 6-days at Athens Ultramarathon Festival - Follow here! Newer PostWhat's your favorite distance?